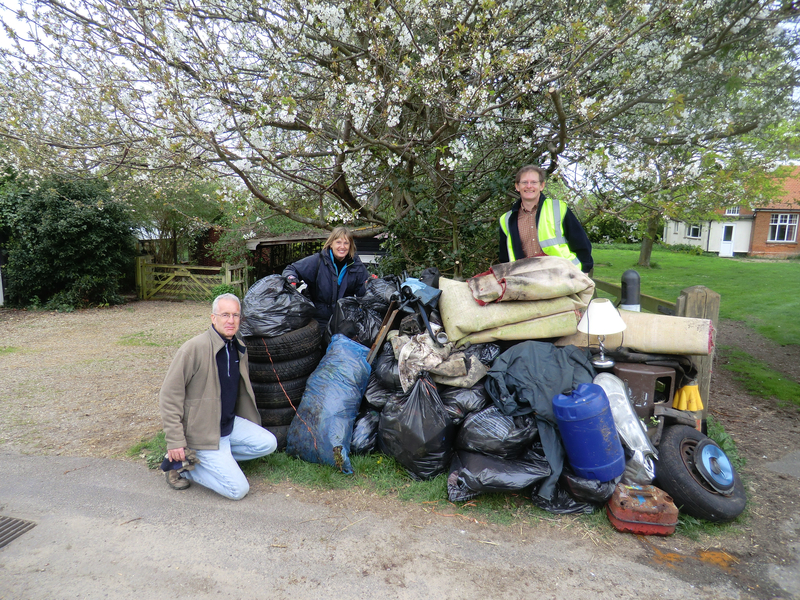 Capel St Andrew & Butley turned out in the morning to do The Clumps and other roads, collecting around 13 sacks of rubbish plus tyre, carpet, paint spray, broken metal roadside signage frame and broken Dyson vacuum. Thanks to Jean Dean for coordinating this team. Boyton cleared the roadside from the Mary Warner Homes out past Little Scotland to the junction with Melton Road. For such a relatively short stretch we amassed quite a mountain of rubbish, which included: around 20 sacks of litter, 6 car tyres/wheels, bicycle wheel, tractor inner tube, bedside lamp, a jerry can and metal fuel container, chemical canister, 12″ speaker, plastic bollard, two large carpets, many empty bottles (alcohol). The majority of litter being mostly plastic drink bottles which would otherwise take hundreds of years to decompose. See photo to get a feel for the size of our hoard from just the Boyton and Capel/Butley collections. Many of the other villages across the Peninsular also cleared their roads over the past few weeks. Not forgetting Suffolk Coast & Heaths for kindly providing the necessary supplies/equipment and the Suffolk Coastal Waste Collection team for taking it all away and disposing of properly. Special mention too for the SWT Sandlings Team under the leadership of Ben who cleared the worse stretch of Melton Road from Hollesley water tower and Heath Road through to the picnic site. That long road is particularly bad for litter and quite dangerous to work on being so fast and straight with passing vehicles. My thanks to everyone who has turned out over the recent weeks, and to the invisible army of stalwarts who regularly pick up what they can as they walk around our lovely countryside which, for the time being at least, is now looking clean and tidy once more. All helping to create the greenest, and cleanest, county. Feedback welcome for any sensible suggestions for ways which we can stop people being tossers!